Our family loves popcorn! It's a tasty, economical snack, especially when you make it yourself. You can control the amount of salt and butter that you put on it. You can also choose the type of oil that you pop it in. I've tried many different oils and discovered that olive oil works well for us. It tastes really great and we like knowing that we are choosing a heart healthy oil. I don't add butter, just a little sprinkling of salt and the popcorn tastes great. 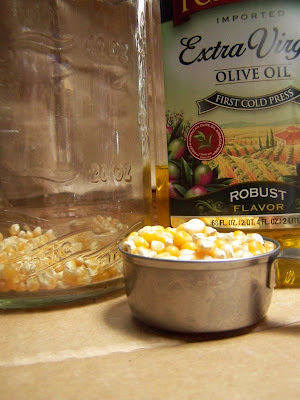 I'm guessing the salt sticks to the traces of olive oil on the popped corn. 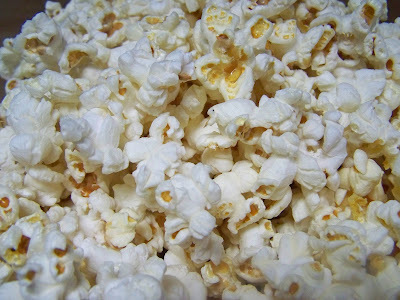 We have a popcorn popper that pops very well using only a tablespoon of oil to pop a nice sized batch. Before our microwave bit the dust (we haven't had one for over a year now and surprisingly, don't miss it! ), we would buy microwave popcorn. Despite the expense, it was convenient. I always felt slightly guilty though when I would read the unhealthy ingredients added to the microwave bag. You don't add butter or salt until after the popcorn has popped so you can completely control the amounts! Isn't that an awesome thing? I do hope you'll visit Nicki's spot and view her instructions, as mine are not complete. I hope this was helpful! And as always, I really appreciate your feedback. I just tried this this week! It works great. ....and now I want to plant popcorn in the upcoming garden. Thanks for the follow -- I'm looking forward to reading yours too. Looks like good stuff! Glad to hear this worked for you as well! Thanks for stopping by! 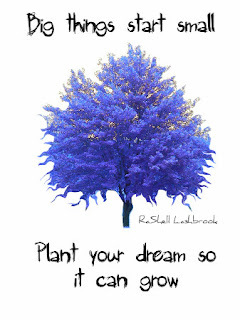 I'd love to know how your popcorn grows for you. We've considered it but on less than an acre we're a little concerned that the corn may cross pollenate and we've have all sorts of unusual corn! I love popcorn, caramel corn (I have the best recipe) :O)... cornbread, fresh corn on the cob! Well you get the idea. I am allergic to it I found out a few years back when I had had to have some allergy/food testing done for health reasons. Out of all the foods I can not eat any longer Corn is without a doubt the one I wish I could get back!!! mmmmmm its so good!! 4 years plus a few months no corn, whew I still miss it greatly! My mom is allergic to corn too...she can have it once in a while without any diverse effects other than feeling sluggish and tired. But if she eats it more often she gets horrible headaches. Wow, cancerous ingredients! I'd not heard that but I'm not surprised. Seems like last time I read the ingredients, there were components that I couldn't pronounce and that's never a good thing. Glad to hear you can have microwaved popcorn again, worry free! Thanks, Prepper J, for stopping by! Aw, thanks for sharing! I love that I can do this. My girlfriends toddler is on a popcorn diet....and this has worked out swimmingly for her. Love love love your site! I'm with the toddler! I could eat popcorn all the time! Thanks so much for your encouragement! I do hope you'll stop back by! Your welcome Patty! Please do stop by Nicki's Kitchen, she has a great tutorial and other information as well! We don't have a microwave either, but I think this is terribly clever. Maybe I should make some for Dan to take on the road with him. Popcorn is such a healthy snack. That's a great idea, Leigh! I love that you can pop in the microwave without oil of any sort too! So true Catherine! Thanks for the visit! Yep, I've actually done this before and it works well! Nezzy, Thanks for visiting! Glad to know it works for you too! You have a wonderful week as well! You have the most wonderful ideas on your blog. I am looking forward to following you. I sure appreciate your vote of confidence! Thanks for visiting. I hope you'll enjoy my future tips as well! I think I'll have to write a post about my popcorn saga. I tried every method under the sun. All of my attempts at microwave popcorn ended up slightly scorched. This may be because it offends my overly frugal sensibilities to leave any kernels un-popped, so I always left it in too long.